Oftentimes when playing on the Wii U, it can be easy to forget that one of the major selling points of the console is that it features a second screen on the controller. Sure, a game here or there may attempt use it in an "innovative" way, but it seems that most of the time the second screen is simply used as a screen mirror or as something supplemental, such as an inventory or a map. 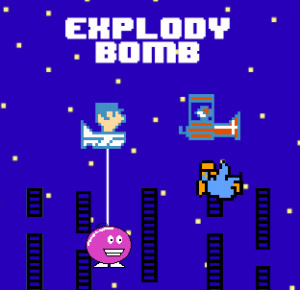 Explody Bomb aims to buck this trend by presenting a fun and simple arcade game that would require players to constantly be using both screens in order to succeed. Ideas don't always make the flawless transition to reality, however, and while this is a game that does use both screens, its implementation of this concept is quite poorly executed. 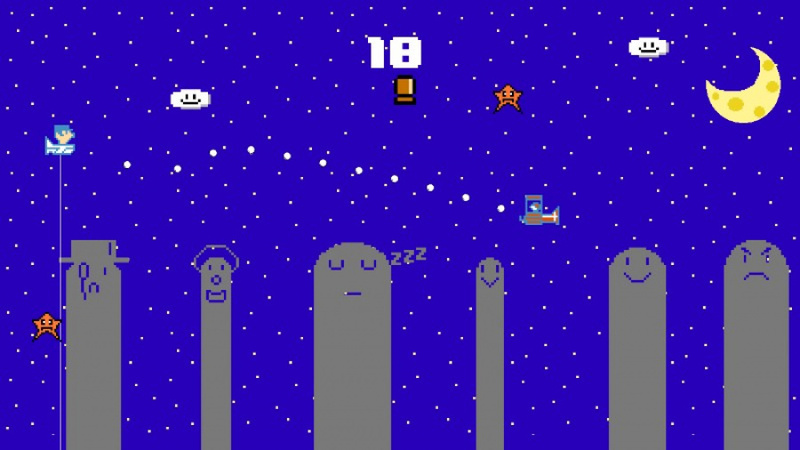 Players take control of both a pilot and the titular Explody Bomb, with the goal being to fly as far as you possibly can. 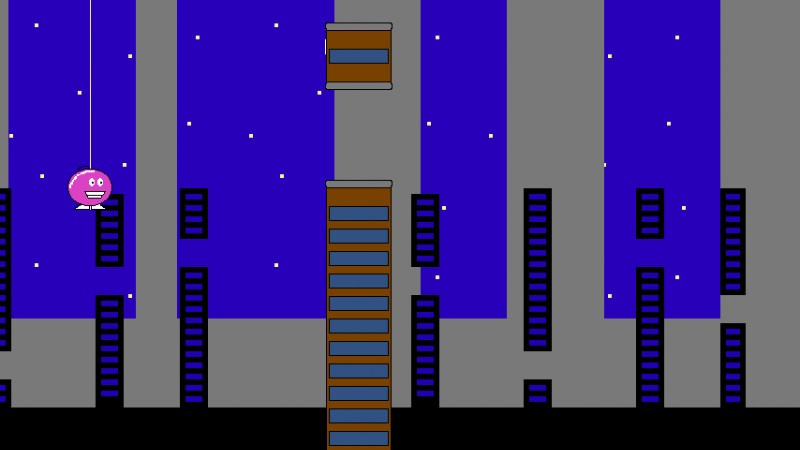 Along the way various obstacles get in the pilot's way on the top screen, while the Explody Bomb must dodge between buildings in a Flappy Bird-esque style on the bottom screen. This is where one of the main problems with the gameplay arises: it's quite a task to ensure that both characters survive. Perhaps if the mechanics were a bit more forgiving, this concept would be made more bearable, but it ends up significantly hindering the experience. On the top screen you have a constant barrage of floating star characters - who inexplicably can't be shot by your bullets – that you must dodge and an occasional "enemy" that flies at you. Now, technically, you have a way of fighting back at these enemies, but the problem is that your gun can only shoot one bullet at a time and it travels hilariously slow. What this means is that you have virtually one shot at removing the enemy, as you won't be given enough time to reload and take another. In just about every other Shmup it wouldn't be a big deal if you failed to destroy the enemy, but here it's an instant game over if an enemy slips past you. While all this is going on, you have to ensure that the Explody Bomb doesn't hit any of the buildings on the bottom screen. Every few seconds you approach another building that has a gap that's just wider than the Explody Bomb itself; yet while you're focusing on precisely positioning the bomb to safely pass through it's suddenly game over and you realize the pilot crashed into one of the stars. Similarly, you'll be focusing on lining up a shot on an enemy on the top screen when the game ends and you realize the Explody Bomb hit the side of a building. The problem here is that the game is practically unwinnable; if you keep equal attention on both screens, you won't have the precision required to perform certain actions on either, but if you focus on one screen, you'll miss what's happening on the other. It's a system that fundamentally doesn't work and becomes both boring and frustrating very quickly. Additionally, the audio and visual presentation leaves much to be desired. For starters there's no background music. At all. The only "sound design" present here is the sound of your peashooter firing, the sound of an enemy exploding, and the sound of your own plane exploding when you fail. Guess which one you'll be hearing the most often? 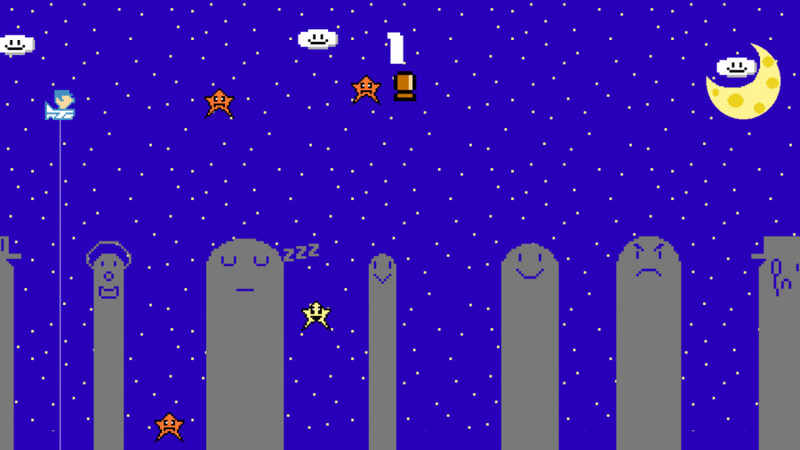 The 8-bit spritework is decent but nothing special, and the background is an extremely basic night setting that endlessly repeats itself. The visuals quickly grow stale and this - coupled with the absence of any kind of background music or sound - makes the game feel unfinished. Altogether, Explody Bomb is an extremely underwhelming product. The slipshod and unforgiving game mechanics mostly fail to provide any sort of meaningful entertainment, the visuals are basic and unremarkable, and the sound design is virtually non-existent. It may be only two dollars, but there are many better games on the eShop for that price. There are few, if any, redeeming qualities to Explody Bomb and we'd strongly recommend that you skip over this one. I'm surprised it got more than a single star. The design of the smiling purple bomb looks like the kind of thing you'd see in a generic old YouTube video from 2007 that was made using Microsoft Paint or something. I like that they tried to use both screens but it also shows one of the Wii U's major weaknesses in that it's near impossible to keep track of both TV and Gamepad screens at once. This game might be a lot more fun on a DS with the screens being smaller and closer together. So it's basically just trying to play two different games at once? If I wanted to do that I'd use my iTouch to play flappy bird and my 3DS to play something else. There, now I've played this game! I would love to defend GamePad multi-tasking gameplay, but seeing as this looks like a pile of dung, I'll pass. No background music, the Flappy Bird naming convention? It's one of the many games that exist simply because people will download anything, despite minimal production resources. Still, I have a hunch that I wouldn't mind the challenge of paying attention to two screens as much as the reviewer. We're sorry that you didn't enjoy the game. Please note that we take your feedback to heart and consider it for this and future Wii U and XBOX One gaming products. Please note that there are some general bug fixes coming to the game and we're adding some features that people wanted, such as music and using the ZR Button to fire. There is also a bigger update planned with new features and updated graphics. We will continue to maintain the game as long as there is interest in it! You can track our progress on this and future games by visiting Alkterios Games' website, social media channels, and Miiverse communities. Thanks for your review. @millarrp I can argue with that price when the game's not available outside the US.